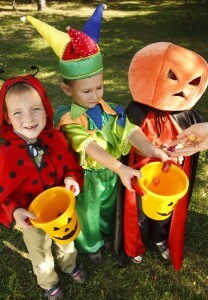 Halloween is fun for kids and adults alike, but it’s important to make safety a priority too. You’ve probably made sure your children are well aware of what they need to do to be safe tonight, but have you considered your own safety needs? Keep these safety tips from Security Today in mind when you’re out with your children trick-or-treating this year. Plan the way you’re going to go ahead of time and stick to it. Plan to go through areas you’re familiar with and those that are well-lit. Bring a flashlight to keep your path well-lit. Make sure the batteries are fresh before you head out for the night! After the early evening, older kids start to come out for hijinks and mischief. Wrap up your trick-or-treating by 9. By then, your kids will probably be tired anyway. Get some reflective tape and put it on your and your children’s arms and legs. This will help drivers on the road see you more easily. Always stay on the sidewalks, unless there are none, in which case stay as far to the side as you can. Write your contact information on a small piece of paper and pin it inside your child’s costume. Tell them if they get lost to approach another family of trick-or-treaters and ask for help. This entry was posted on Thursday, October 30th, 2014 at 3:16 pm. Both comments and pings are currently closed.